With Opera Atelier, a company renowned for bringing a corps de ballet and the Tafelmusik Baroque Orchestra to the opera, there’s little chance of a dull moment onstage – which, to be perfectly honest, is exactly as I prefer. Idomeneo does not disappoint on this score, nor on hardly any other. It’s a banquet of delights, really, though some of the tastes were unexpected. For Idomeneo, Opera Atelier invites its audience to travel back in time, not to Ancient Greece (where the play is set), but to Mozart’s Italy of the late 18th century. The violoncellists and the harpsichord are out on the floor, spilling out of the pit and towards the audience. You can almost see the oil lamps lighting the stage as you hear the tale of king Ideomeneo, late embroiled in the wars between Greece and Troy. Believed to have been drowned, it develops that he is alive after making a very difficult bargain with Neptune, god of the seas. Tenor Colin Ainsworth gives an excellent reckoning of Idomeneo, satisfyingly muscular in both acting and musicianship. His slightly darker tenor suits his regal demeanor, while giving him the sprightliness needed for Idomeneo‘s emotional range. Megan Lindsay, as Ilia (the Trojan princess who falls in love with Idamante, son of Idomeneo) joins a cast of largely excellent actors. Her vacillating despair and longing come beautifully through in her bright voice, tight and ringing in distress and reaching a rounder, richer place as she settles into her duets with Wallis Giunta as Idamante (originally written as a role for a castrato). Giunta’s Idamante was the real surprise and joy of the evening for me. She combined tremendous acting as the youthful ruler surprised by love (Idamante’s love is enlivening; his forlorn despair droops off the stage) and her voice felt in moments of longing like it could stop time and pierce dimensions. By the third act, when Idamante draws up his courage and sings No, la morte io non pavento (I am not afraid of dying), I was sold. Last, and unfortunately least, this bring me to Measha Brueggergosman as Elettra, a much-hyped performance that left me… underwhelmed, when I was hoping for the opposite. I’d listened to some studio recordings of her and was excited to enjoy her range and depth live, but onstage she was hard to hear and not especially compelling in her acting, either – lots of pacing and stylish hand gestures but I never felt or saw the hatred I expected toward a foreign interloper who stole her betrothed and usurped her crown. In a few moments she rose to a place from which I could see what the fuss had been about, but overall it was difficult to find the electricity promised. Plenty of praise is left for the Opera Atelier ballet, even if they did look a little cramped on-stage in some of the more crowded scenes they still bring a dimensionality and robustness to this Idomeneo. I thoroughly enjoyed them, and of course they are all exceptionally talented under the choreographic direction of company co-director and co-founder Jeannette Lajeunesse Zingg, spectacular in all senses. And though I was initially a little startled to find myself sitting just below a cadre of choristers (Chorus of the University of Toronto Schola Cantorum, along with members of the Choir of the Theatre of Early Music), having them right there in the stage left boxes lent an additional layer of texture to an already generously colored experience. 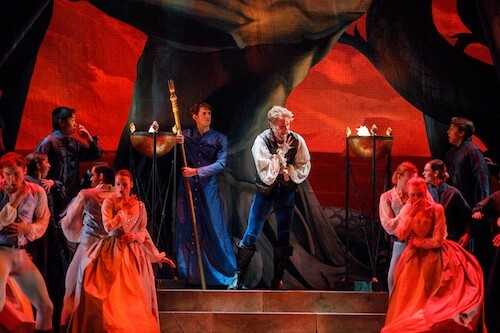 Idomeneo plays until April 13, 2019 at the Ed Mirvish Theatre, 244 Victoria Street in Toronto. I concur 100%. I have watched Miss Giunta grow into possibly the best Canadian opera performer we have. Bravo to opera atelier for bringing this cast together.